Shred Guitar Riffs, Pantera "Mouth for War" - Free Pantera Shred Guitar Riffs! This free shred guitar riff is "Mouth for War" by Pantera. Here's the intro to the song. Notice that the 2nd measure is played twice as fast as the 1st measure. Start off this shred guitar riff with some palm muted single notes and B5 power chords. Then do some more power chord and a few slides. Remember to play measure 3 the 1st 3 times and then play measure 4 the last time. 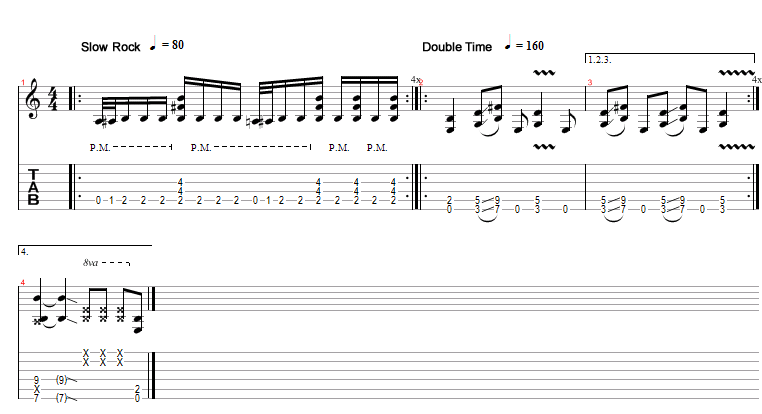 Keep practicing this Shred Guitar riff until you can play with the audio labeled "Faster" because this is the riff at actual speed. With this lesson you can learn to play "Mouth for War" by Pantera. Pantera Shred Guitar Riff - "Mouth for War"